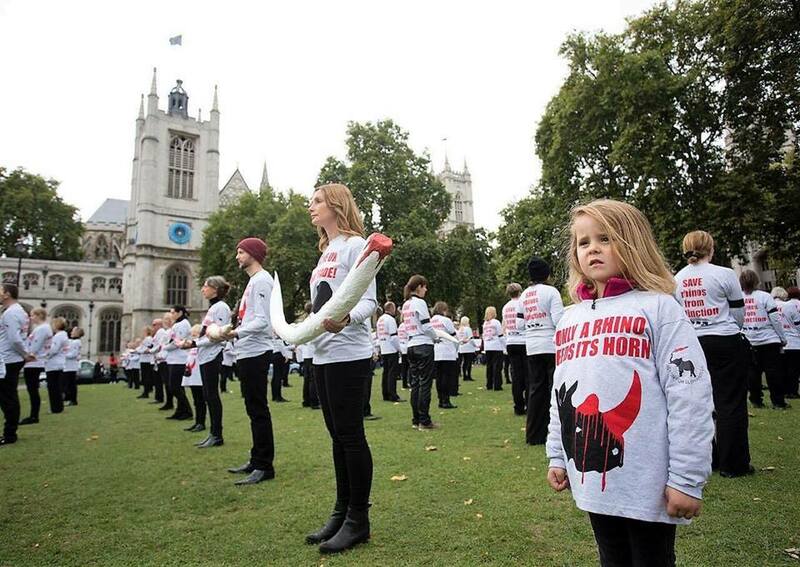 Why The UK Ivory Trade Must Stop! 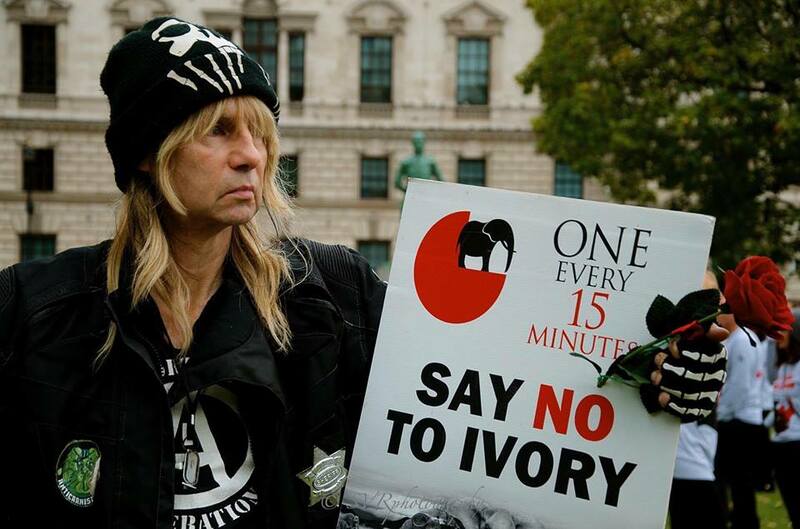 On October 7th 2017 whilst we all went about our leisurely Saturday’s, hundreds of people showed up in London’s Parliament Square to protest the UK’s part in the world ivory trade. 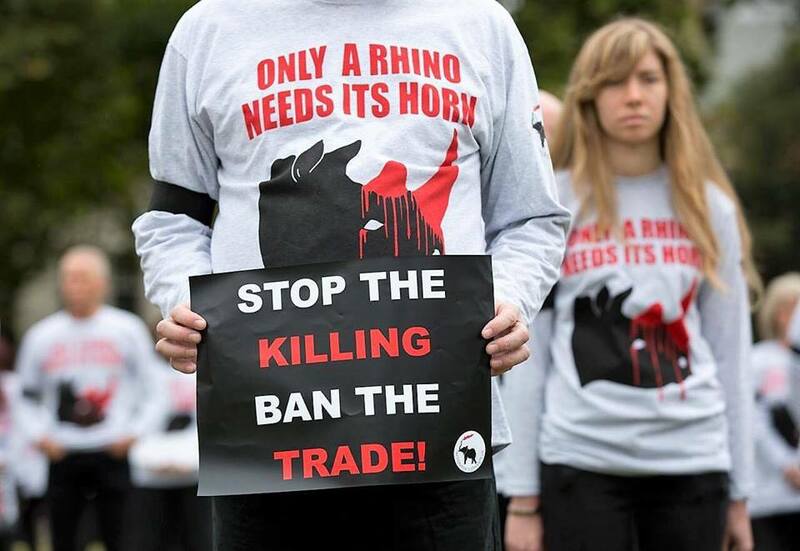 Whilst tourists and civilians walked by, people of all ages stood in silent protest for half an hour, holding fake bloodied tusks and wearing protest shirts, with an African drum as the only sound. A powerful and peaceful protest in the midst of a bustling, oblivious city. 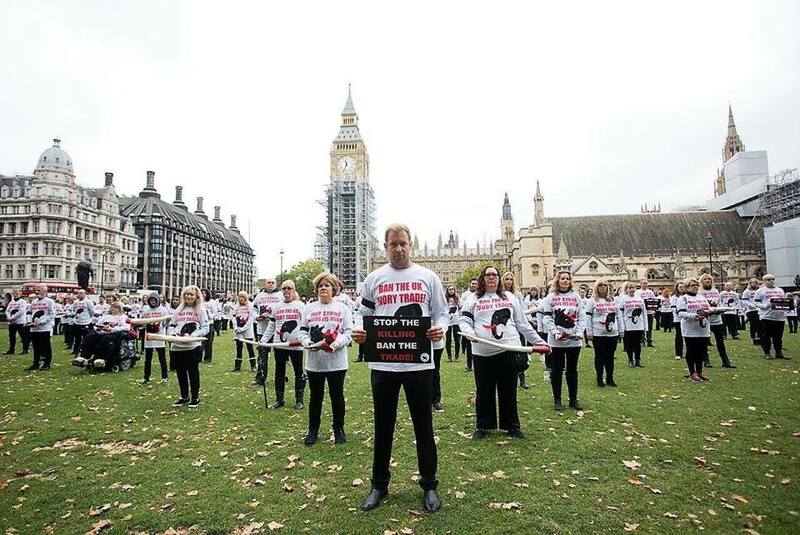 The silent protest was arranged by ‘Action for Elephants’ and attended by members of the ‘Born Free Foundation’, such as Will Travers and Dan Richardson, in the hopes of sending an important message to parliament: to save rhinos and elephants from extinction by banning the UK ivory trade. At the same time as the silent protest occurred, a letter was delivered to No. 10 Downing Street, addressed to the Prime Minister herself. This letter was signed by Conservationist Organisations and begged for the Prime Minister to follow through on the Conservatives’ initial intentions to ban the UK ivory trade. The intention to push for a ban was initially on the Conservatives manifesto for the past 3 years until it was recently removed. But whatever the reason, the Tories have not made good on their promise! While the UK may be thought of as a ‘forward-thinking country’, there is a loophole in our system. While the UK doesn’t allow for ‘young ivory’ to be sold, it does allow for ‘old ivory’ to be sold. It is fairly easy to fake age on ivory and alternatively it is difficult and expensive to check the age of ivory, so therefore people don’t tend to waste the time or effort in finding out its real age. This allows for ivory to be laundered through the UK using this loophole. The more that the public keep applying pressure, the more likely it is that the government will follow through. Elephants are highly intelligent and emotional animals, so they feel the repercussions of human’s actions upon their kind. The fact that elephants bury members of their tribe and mourn for them when they die says it all really. And I’m sure you’re aware that many species of rhino are bordering on extinction, with a subspecies of the Javan rhino declared extinct back in 2011. Most rhinos that are left on the planet are through conservation efforts, but species such as the Northern white rhino are extinct in the wild. 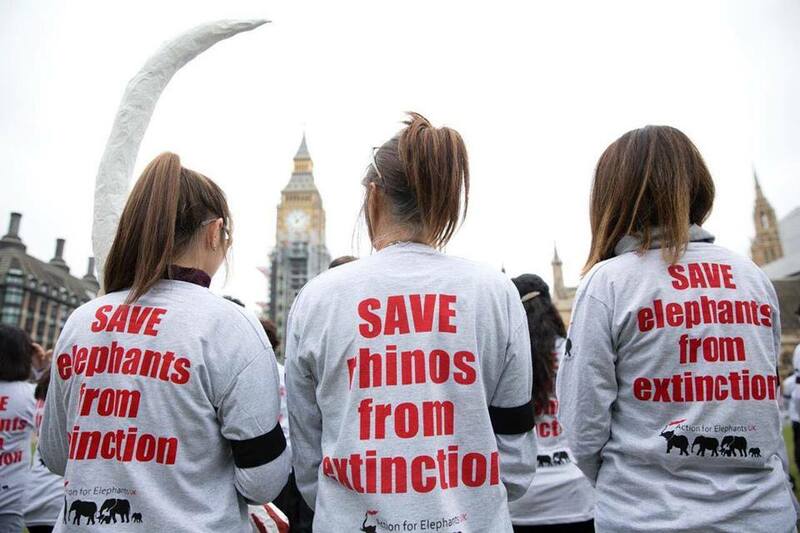 What you probably weren’t aware of is that elephants are, too, on the verge of extinction. According to the World Elephant Day website, numbers of the species have dropped by 62% over the last decade! 62% in 10 years! That is terrifying! The main reasons for their dwindling numbers are ivory poaching, poisoning from palm oil plantations and retaliation when elephants fight back against the humans that keep them in captivity. Experts have predicted that elephants could be extinct within just a few decades. I really commend people who have the bravery to take a step forward and stand up for what they believe is right. It’s far too easy for us all to sit in our glass houses, but so many of us are afraid to throw stones in case they come back at us. I would have been there, did I not live in the North of England and have to work that day. So this blog is my little piece of trying to help; this is my way of trying to spread awareness. So how can YOU help to continue this fight? 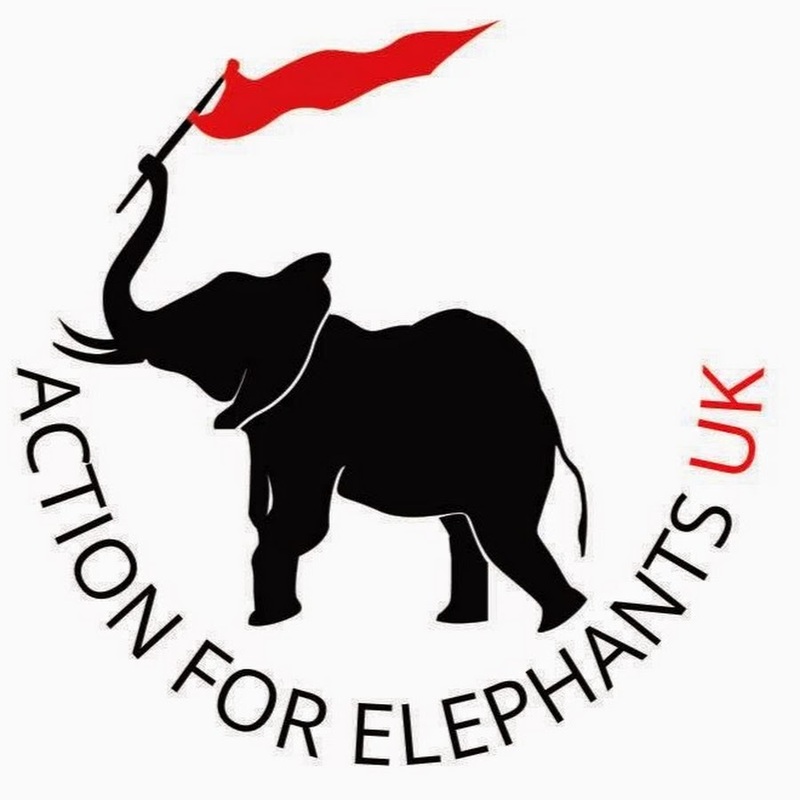 One thing you could do to help is by signing the petition to ask the UK government to help stop elephant poaching at the WWF website. 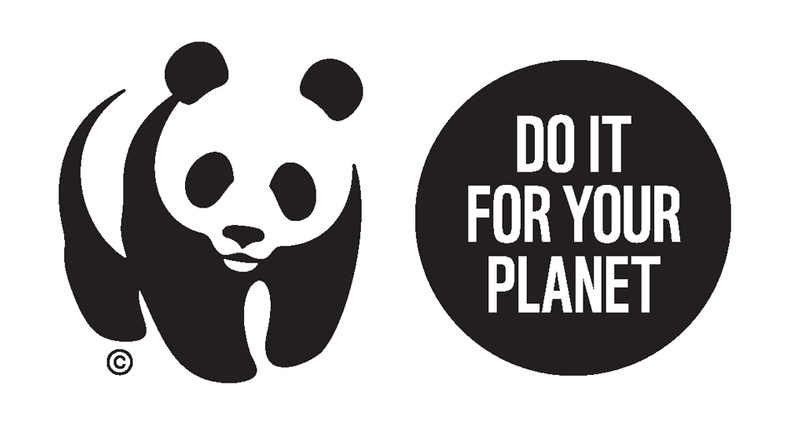 You can also find lots of information on other campaigns and issues our planet is facing; perhaps you will find another worthy cause that you want to support too! Another thing you could do is write to your local MP urging them to vote in favour of the UK ivory trade ban. I know what you’re thinking: “Urgh that is SO much effort!” But the things that matter are never easy. If you want to see change, you have to do something about it. And let’s be honest, you spend hours on end scrolling through social media every day; the least you could do is take 5 minutes out of your day to compose a letter. This is a copy of the letter that was delivered to Theresa May on the 7th October, which makes for interesting and empowering reading. (It’s not long – don’t be put off by the large scrolling bar!) You can also see down at the bottom of the page the MP’s who have signed the petition and are backing the ban. Thankfully my local Leeds MP’s are already backing it, however as many people backing it as possible can only help the cause further, so I intend to write to my local Knaresborough MP asking for support for this cause. Educate yourself further to the plight of elephants around the world by watching documentaries such as ‘Gods in Shackles‘; a powerful, recently-produced, documentary about the mistreatment of elephants in India. Want to really know what happens behind the scenes of Kerala’s glamorous cultural festivals? Watch the trailer at the Gods in Shackles website. I know that I, for one ,don’t want future generations to sit in their classrooms and learn about the animals that used to walk the planet and have elephants or rhinos on that list. We have the foresight to see what is very likely going to happen in the near future, so while we have the power to do something about it, let’s do it! No creature deserves to be wiped out, especially not for humankind’s personal gain. The worth of an animal’s tusk was only decided by mankind; it is NOT actually worth anything! The only creature it is worth something to, is the animal that it came from, because it is worth its life. Credit: Thank you to Carla Fraser for providing me with information for this blog article and for opening my eyes to the efforts that are a work in progress to save these majestic animals.